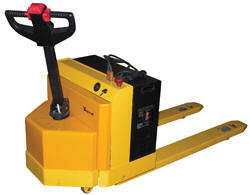 Electric Pallet Jacks & Commercial Pallet Trucks. In order to make it easy to move palletized loads around the warehouse, and to facilitate simple loading and unloading from trucks without the needs for conventional fork lift trucks, electric pallet jacks offer an ideal solution. Thanks to their ability to quickly and efficiently raise the load off the ground and the fact that once in use they are much more simple to move around than conventional manually operated versions, you will find that these electrically powered lifting tools can make a big difference to the efficiency with which staff are able to move their products around. There are a wide range of different designs and manufacturers of electric pallet jacks that supply products through Easy Rack, and in general, all of the different manufacturers offer simple variations on a basic the functionality of the jacks, with subtle differences depending on the actual model that you choose. By replacing the conventional pumping system with an electric motor to raise the load, it makes it much simpler for staff to raise the load to move it around the warehouse, and this in turn ensures that they are able to achieve the relevant goals that are set out for them. One of the main advantages of using electric power rather than manual systems is that is possible to include a much larger range of movement within the load raising system. Whereas a manual system is generally limited by the convenience that it offers – raising the load too high takes a lot of time, and is not a process that staff will generally undertake. With an electric pallet jack, it is possible to raise the load much more quickly to a greater height. This means that the user will find it much simpler to lift a palletized load to a level where it can be conveniently handled by the end user rather than leaving the items at floor level. By making it simpler and more convenient for other staff to take items from the pallet, or to gain easy access to a heavy or unwieldy load, the process of using the jack can be made much easier for all users. Thanks to the strength of the load bearing platform on an electric pallet jack, it is possible to lift surprisingly heavy weights and make it easy to move them around the warehouse of factory. In addition to this, it is also much more straightforward to get heavy loads onto a truck or trailer with the jack rather than using a forklift. The single button control system that is used by the electric pallet jack means that it is a much more straightforward system when in use than conventional jacks, so users will only require a very short training session before they are confident to use the truck properly. The latest electric pallet jacks offer the same kind of pneumatic or hydraulic lifting capabilities of their conventional rivals, and are quicker and more efficient ]in use. Staff with access to electrically powered pallet jacks will find it much easier to carry out their duties and this will lead to greater productivity, ensuring that your business is more successful. Safety features include a horn and reverse button warning. 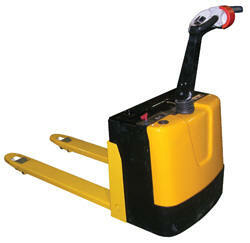 Pallet lift trucks run off 24V batteries with battery charger standard. The 3,000 pound capacity models use two 12V batteries with 70Ah rating. The 4,500 pound capacity models use four 12V batteries with 180Ah rating. Electric pallet trucks will typically achieve a minimum of eight hours of service on a full charge. Easy to operate throttle for forward and reverse direction. Easy Rack carries a wide variety of pallet trucks, commercial shelving, material handling equipment, used pallet racks, and modular buildings installed nationwide. If you can not find what you are looking for call us toll free at 1-888-776-3720 and we will find it for you. Our home office is located in Houston, Texas with regional distribution centers loacated in all 50 States including New York NY, Los Angles CA, Miami, FL. Chicago, IL. Denver CO., Dallas TX, San Antonio, TX, Austin, TX, Boise ID, Atlanta GA, Albuquerque NM, Raleigh-Durham NC, Washington DC, Albuquerque NM, Huntsville AL, Fayetteville AR, Norfolk VA , Madison WI.